Brilliant was the first word that came to mind after reading Song on the Sand by Ruth Sims, then it took some moments for me to try to bring together exactly why, because so many elements of the story are outstanding: wry wit, believable conflict both internal and external, a sympathy with the characters, all of them presented, which grabs you from the first page and never leaves. It was as if looking into the life and soul of another human being, quite conscious one is the observer but also empathetic to their emotions and feelings, their deepest fears and loves, their sorrows and guilt. Immediately you are touched by the plight, the frustrations of the main character, and the wistful nature of his dreams interlaced with thready anger at his own impotence. 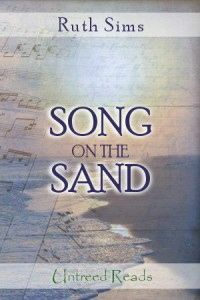 “Song on the Sand” is thoughtful and poignant in all aspects. The only slight question I had was that since the secondary character had played such an important part of the story, why at least a more substantial description of how the outcome of events affected him wasn’t given. The twist in this speculative story might be hinted at early on, but when it fully arrives, you welcome it even though you know what it means. It’s the type of story you take a deep breath after reading, sit back and nod to yourself in complete satisfaction. It’s that good. Long after you’ve finished, you’ll feel the warm glow Ruth Sims brought to you in her short story. I absolutely loved it. Please visit Untreed Reads website to purchase your copy of “Song on the Sand” by Ruth Sims. Posted in Reviews. Tagged book reviews, reviews, Ruth Sims, short stories. Thank you from the bottom of my heart for the beautiful review. I’m so glad you loved it as much as I do. I think, next to Counterpoint Dylan’s Story, it’s the best thing I’ve ever done. It was my pleasure. It’s one of the best short stories I’ve ever read. I so deeply enjoyed it.